Did you know that per calorie, kale has more iron than beef and more calcium than milk? It’s one of the most nutritious foods you can put in your body, and I look for chances to sneak it into my meals whenever I can! 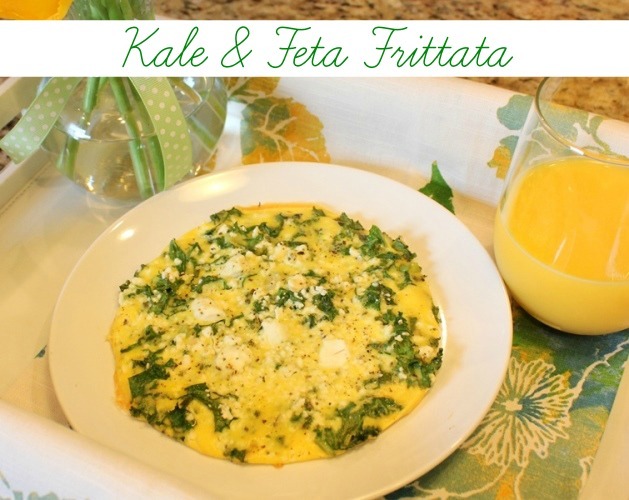 My most recent kale creation is this Kale & Feta Frittata. It’s so delicious, and a great introductory recipe for anyone nervous about trying kale! The kale gets wilted down in the skillet and then baked in egg, so you barely even notice when you’re eating it. Grab some kale and scallions from your garden or local farmer’s market and enjoy! Heat olive oil in a small ovenproof skillet over medium heat. Add scallions and kale and cook, stirring, until wilted (a few minutes). Pour eggs over kale and scallions. Top with feta cheese and season with salt and pepper. Transfer skillet to oven and bake until eggs are cooked through (I bake mine for 5 minutes). This recipe serves one, but you can easily multiply it and use a larger skillet to serve more people. 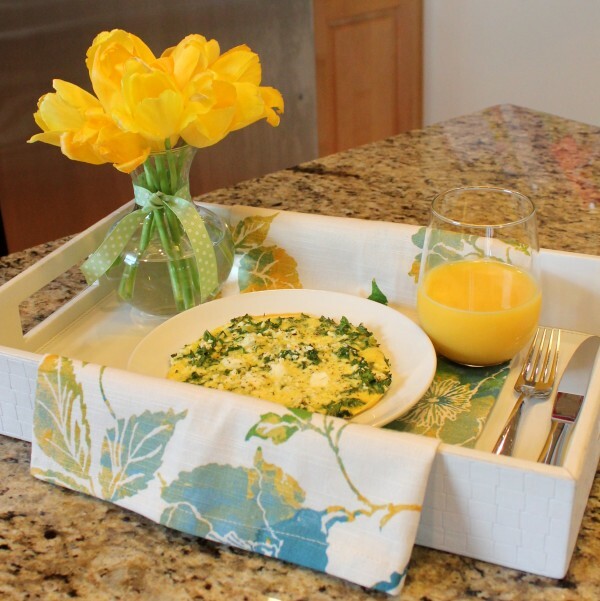 Kale & Feta Frittata – the perfect breakfast to treat a loved one (or yourself!) with for breakfast in bed. Time-Saving Tip: Think you’re too busy in the morning to enjoy this wholesome breakfast? Then this tip’s for you! I chop up a bunch of kale and scallions at one time and divide them into freezer-safe dishes – one frittata serving of veggies per dish – and pop them in my freezer. When I’m ready for my frittata fix I simply grab a pre-prepped portion from my freezer, toss it into my skillet and begin sautéing away! It’s a great way to reduce your prep time when you’re in a hurry! Interested in saving even more time in the kitchen? Check out some of my favorite “bulk prep and freeze” meal and snack recipes! Looking for another kale fix? Then this green smoothie recipe is for you! Check Katie Bowers blog she’s got a pillow to match your towel. I think thats so funny. Just clicked over. Too funny! What type of Kale do you use? My Farmers Market has a couple types & recently I bought Winterbor Kale & made Kale chips. This looks yummy so I gotta make it next! I’m actually not sure, Tara. (hangs head in shame) I’ll have to pay better attention next time I’m at Whole Foods. They only have one kind and that’s what I buy. Great call on the kale chips! It’s been a while since I’ve made them – I’ll have to make a batch up again soon.